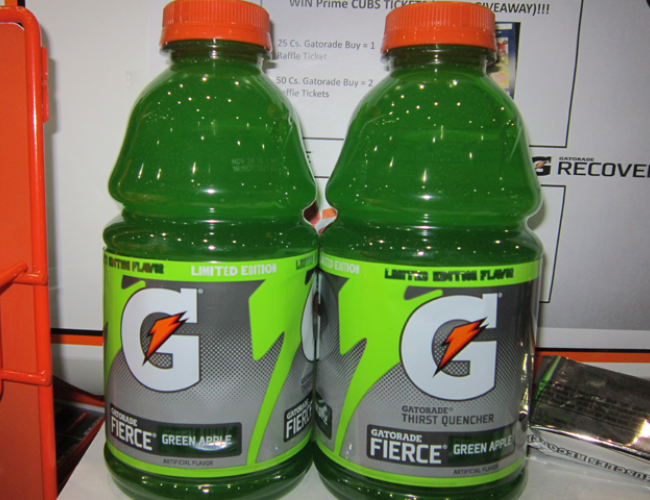 Gatorade Fierce Green Apple is a green apple flavored sports drink from Gatorade’s Fierce lineup. It’s not Fierce Green Apple, it’s Green Apple from Gatorade Fierce. Either way, it’s green apple flavored. It’s tastes like a liquidized version of a green Jolly Rancher, only watered down. It’s kind of sweet but still retains the sourness of a Granny Smith apple. It tastes good, but I don’t think it’s chuggable and Gatorade should be chuggable. You need to replenish your electrolytes as fast as possible and you can’t do that if you can’t chug it. This is the type of Gatorade that you would get when you’re just a thirsty dude, not when you’re doing something athletic. It’s also a limited edition flavor so you only have a small window to experience it. I don’t know when the window is closing either, so you better get on it right away if you want to try some. Carpe Greenum – Seize the Green.